There were Ritz crackers, Club crackers, Triscuits, Chicken in a Biskits, Honey Maid graham crackers, and even Premium Saltines (those great objects of desire in Ed Ruscha's 1970 film Premium) sitting on plates on a table at the opening of The Kitchen's latest show, "Shame the Devil," on March 17th. Very much ready to eat, I was sad to learn that the fine spread was not for the visiting public, though my pain subsided somewhat when I learned that they were to be used for a performance by artist Kenya (Robinson). At least someone would be enjoying the tasty snacks. 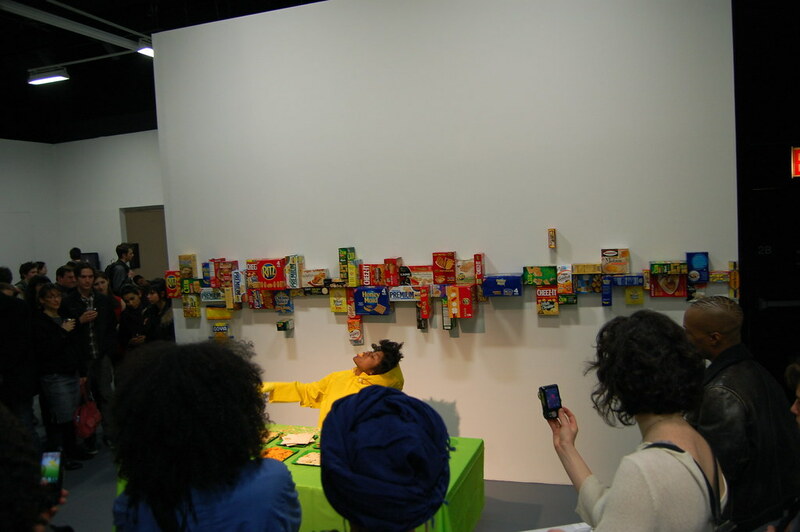 (Robinson) last popped up at the Dependent Art Fair, where she occupied Recess Activities' bed as part of a long-term performance piece, The Inflatable Mattress, which involves serving as a house guest for 13 weeks, spending seven days at each location. (The Dependent was a special one-night stay.) This time, at The Kitchen, she shifted her attention from sleeping to eating, offering up Kenya Eats a Cracker. 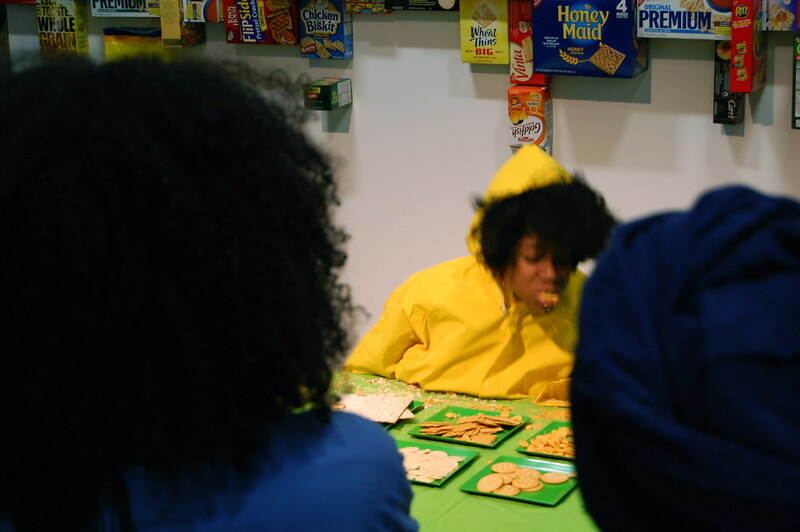 Wearing a yellow raincoat, she walked up to the cracker–covered table, sat down, and started eating. A crowd formed around her as she grabbed crackers by the handful, stuffing them in her mouth, staring up at the crowd, and chewing in rapid bursts as crumbs fell from her lips. A voice came from nearby speakers as (Robinson) enacted her feasting. "At Triscuit, we believe less is more," the affectless narrator intoned. "That's why we bake our crackers with quality ingredients like Soft White Winter Wheat." (All quotes come from a paper available at The Kitchen, where (Robinson)'s cracker boxes are still on view.) The narrative traveled from the production of Triscuits to the history of Carr's Crackers ("Jonathan Dodgson Carr created the first table water cracker in 1890…") to the Israelites' exodus from Egypt. (Robinson) kept eating. She took rapid-fire bites, then slow, languorous chews, and then steady open-mouthed munches, offering a full compendium of eating options. (Robinson) seems wonderfully out of touch with the times. Much of the most acclaimed (or at least most visible) performative art recently has involved the glorification of long-term suffering (Marina Abramovic's The Artist Is Present (2010) at MoMA and Terence Koh's nothingtoodoo (2011) at Mary Boone, for instance) or the celebration of middlebrow interactivity (Tino Seghal at the Guggenheim — see Joe Scanlan's "Fair Use" in the May 2010 Artforum for more on that — and perhaps even Rirkrit Tiravanija's current show at Gavin Brown's enterprise). In contrast, (Robinson) — while very much present in her work — engineers for herself a great and pleasurable time: she enjoys the hospitality of friends and acquaintances in The Inflatable Mattress or the bounty of an unusual buffet in Kenya Eats a Cracker. All the while, she twists the codes that govern our basic needs — shelter and food — in ambiguous ways and pushes them toward the precarious point when they may break, when the house guest outstays her welcome or when the woman munching maniacally on crackers moves from a representative of freewheeling fun to an object of ridicule. And then there are the racial overtones in Cracker's title and text. What are we to make of them? "Open other end. Lift tab to open. Push to open. Open here."